Zwaag, The Netherlands (April 26, 2017) – For 30 years French theme park Futuroscope has been thrilling visitors with its multimedia experiences and unique, dynamic rides. To mark the start of its fourth decade, a new €11m state-of-the-art audio visual experience has opened, with an Alcons Audio system delivering the soundtrack. 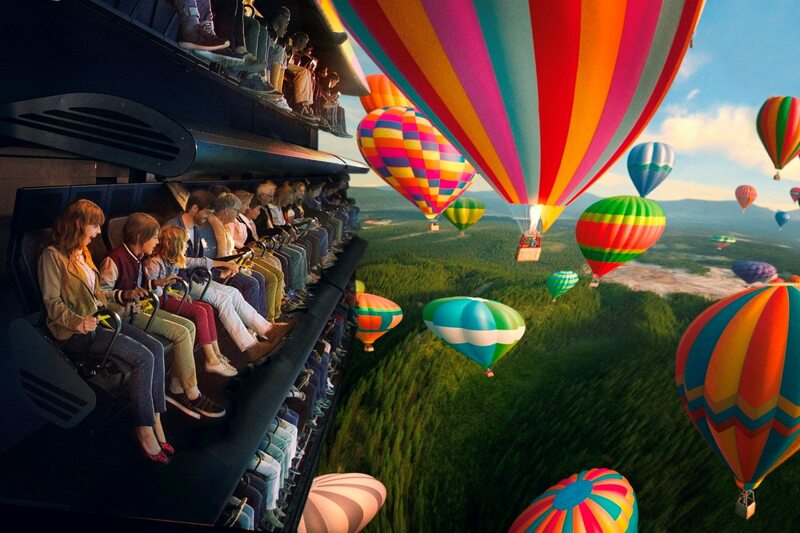 Originally opened in 1992 under the name of The Magic Carpet, the multi-million Euro update of Futuroscope’s IMAX cinema has seen it reinvented as L’Extraordinaire Voyage (The Extraordinary Journey). 84 spectators sit in a triple row of seats on a platform which turns vertical (so the rows are now sitting above each other) and whisks them off on a dynamic ten minute ‘flight’ around the world, accompanied by an orchestral soundtrack and sound effects, plus smells and wind. Complementing the 600m2 hemispherical screen is a 12+1 Alcons Audio pro-ribbon system, supplied by the company’s French distributor Audiolead and installed by Poitiers-based Tedelec Audiovisuel. “We needed a system that would match the drama of the visual experience, playing the soundtrack at a comparatively high volume, but with no compromise on quality. The system also had to be mounted so that the sound from the surround loudspeakers could match the directional subtlety of the video,” says Yannis Marchet, technical manager for the Futuroscope attractions. An added complication for Tedelec was that the audience platform physically moves up and down during the presentation, to give a more convincing feeling of ‘flying’. This meant that the surround system had to also have a vertical dimension, to seamlessly cover all of the audience whatever position the platform is in. A number of different systems were listened to, with an Alcons C-series surround system proving the best solution. The multi-channel 12+1 system is installed behind the screen and comprises five CRS12GT/90 large-format, high-output 12” reference surround units for the five main LL, L, C, R, RR front channels, five CCS12 large-format 12” surround units for the ‘higher’ and two more for the ‘lower’ height dimension and four CB362 high-output double 18”full-size subwoofer systems for the bass frequencies. The system is powered and controlled by three Sentinel3 and one Sentinel10, four channel amplified loudspeaker controllers. Six CMRS-SR reference pro-ribbon surround units are soon to be added to give even greater depth to the sound effects. More information on : www.futuroscope.com , www.alconsaudio.com and www.audiolead.fr . Recent Alcons ambassadors include:, Elbphilharmonie Hamburg, Hamilton the Musical, Broadway New York NY, Dear Evan Hansen, Broadway New York NY, Walt Disney, Lucasfilm, National Theater Sweden, St. Patrick’s Cathedral New York USA, National Theater Finland, but also Jazz at the Lincoln Center Doha Qatar, State Theatre Stuttgart Germany, Red Bull’s Hangar-7 Austria and members of The Ribbon Network, Alcons’ global rental network.